On most elliptical trainers you will find a heart rate monitor that is located on stationary handlebars in front of the console. The purpose is to monitor your heart, thereby allowing you to determine you heart rate. The alternative is heart rate control (HRC), which allows you to control the intensity of your workout by defining the heart rate level you wish to maintain. Why is your heart rate important when you exercise? By exercising in different zones (Intensity Levels) you can achieve different results. For example, if you are exercising and your heart rate is too low, you are not getting the full benefits from your workout. In contrast, if it is too high your activity can become counter productive. The hottest trend in exercise is high intensity interval training (HIIT), where you alternate your workout at different zone, going from high exertion to cool down periods. This is proven to get the best results for weight loss in the least amount of time. How does heart control and monitoring help you to optimize your workout? 50% – 60% of your individual maximum heart rate. This is a safe, comfortable zone reached by briskly walking. 60% – 70% of your individual maximum heart rate. Achieved through a slow jog. 70% – 80% of your individual maximum heart rate. Achieved through a moderate run. 80% – 90% of your individual maximum heart rate. Achieved through a “burning” run. 90% – 100% of your individual maximum heart rate. This zone is the equivalent of running full out, and is often used in “High Intensity Interval” training. This zone should be approached with caution and can lead to injuries when sustained for a long period. How does heart rate control work with an elliptical trainer? By programming your desired heart rate, the wireless strap monitors your heart and then feeds the results to the machine. If your rate drops the machine increases the resistance, and if it increases the resistance decreases. Some models have an interval HRC program, which changes the resistance level so that you can train in different zones. It is similar to the hill training programs found on treadmills. Do you need wireless heart rate control with your elliptical trainer? First, it is beneficial to at least have the heart rate monitor, and as mentioned almost all ellipticals come standard with that feature. As far as wireless heart rate control, that is an individual choice. Team member Fred Waters personally likes to control his workouts manually and instinctively know the level where he feels comfortable. When he am moderately breathing he knows to kick it up. When he can’t maintain the pace any further he knows to slow it down. If you are just starting to get back into exercising you may want to consider a machine with HRC. Consult with your doctor and/or a personal trainer and let them help you to determine the ideal level of exercise as defined by your heart rate. They can help you to establish goals and criteria for increasing your level of exertion. If you are a professional athlete, then HRC can be beneficial for reaching your personal best, especially if you are interval training. 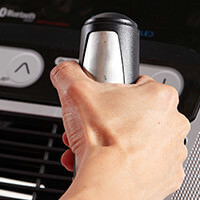 It should be noted that some machines offer heart rate control through stationary hand grips or a wireless chest strap. HRC through hand grips defeats the purpose of getting a upper body workout, since you are can’t use the moveable handlebars. There is only one type of HRC that makes sense, and that is through a wireless chest strap. Although several brands offer heart rate monitors and control through the grips on the movable handlebars. 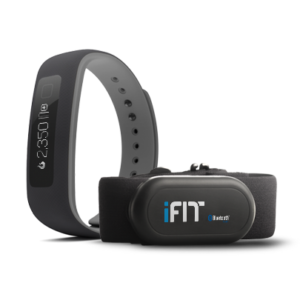 Finally, brands like NordicTrack and ProForm that offer iFit Live sometimes offer a free wearable device (similar to a FitBit) that can help track your activity. 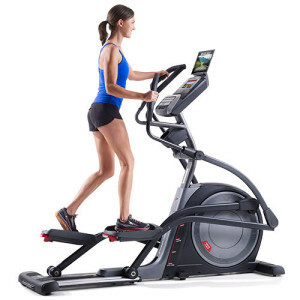 You will find that a number of fitness equipment manufacturers will have two similar elliptical models – the only difference being with or without wireless heart rate control. The variation is cost is usually $200-$300 more. Also, some models are equipped with wireless HRC telemetry, but charge additionally for the strap. Check out more information on our Elliptical Buyer’s Guide or our Best Buy Ellipticals page.